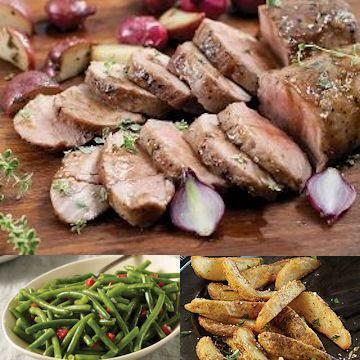 Experience a gourmet�pork tenderloin meal. Our Pork Tenderloin is a nice change of pace with a tantalizing flavor that can only be found in pork. Cut from the heart of the tenderloin for extra tenderness, its convenient 9 oz. size makes it the perfect individual meat servings meal for four. And to complement your main dish, enjoy Steakhouse Fries and healthy green beans. Meal serves 4. This pork roast is excellent when grilled or roasted. Thaw. Grill over medium-high heat for approximately 40 minutes, turning every 10 minutes. To roast, preheat oven to 425°. Season and place uncovered in oven for 25-30 minutes, depending on thickness. Let set 5 minutes before slicing. Do Not Thaw! Oven: Preheat oven to 450°F. Remove fries from packaging and place on a baking sheet with lined parchment paper or foil lightly brushed with oil, leaving space in between. Place sheet in oven on center rack. Bake for 18-20 minutes. Grill: Preheat grill to medium. Remove Omaha Steakhouse Fries from plastic packaging and place on a perforated grilling pan. Heat over grill for 15-20 minutes, stirring constantly. Preparation: Do Not Thaw! Microwave (1100-WATT): Cut slit in center of film. Place tray in microwave; cook on high for 2 minutes. Carefully remove film, stir and cook on high for 30 seconds or until internal temperature reaches 165°F. Stir and serve. Oven: Preheat oven to 400°F. Carefully remove film from tray before baking. Place tray on baking sheet on oven center rack. Bake for 28 minutes or until internal temperature reaches 165°F. Remove from oven, stir and serve. Ingredients: Pork - Beef, Pork, Lamb, Veal and Poultry have been born, raised and harvested in the USA. Ingredients: Green Beans, Butter (Cream, Salt), Red Peppers, Onions, Extra Virgin Olive Oil, Salt, Spice, Garlic. Contains Milk. Ingredients: Potatoes, Sea Salt, Canola Oil, Black Pepper, Dextrose, Sodium Acid Pyrophosphate (Sapp) May Be Used As A Processing Aid To Retain Natural Color.